Alfa has always believed there is beauty in releasing pent up breaths, and by giving life to sacred words that sit on dusty shelves in our precious souls. Known to be unapologetic about her ‘realistic’ take on heartache, she writes to let her readers know they are not alone in their pain. That authenticity gut punches the soul so beautifully, it leaves an imprint long after the last line of her poetic thoughts are read. Alfa is most likely indulging in ice tea on her wide-planked porch in Kentucky, typing out her daily thoughts, or painting a rescued piece of furniture some fabulous shade of turquoise -coloring the world with love, one heartfelt brushstroke at a time. She loves hearing from fans, and answers messages via Facebook, Instagram, Tumblr and Twitter. With chapter headers like Squall, Monsoon, Zephyr, and Exhalation, you know that the emotions depicted within them are going to take your breath away. 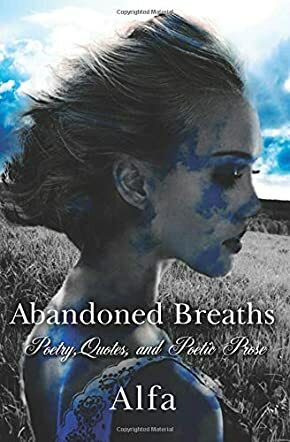 In Abandoned Breaths: Poetry, Quotes, and Poetic Prose (First Edition) by Alfa, the author exposes some of her most profound, painful and rawest work to excise negativity and embrace self-healing. As you read the quotes, prose and poetry pieces, you too will experience changes that will help to create a new you. Words in written form can heal and if you are feeling bruised, misused or seeking to overcome any elements of emotional highs or lows, you are not alone. This book has something for everyone, no matter where your journey may lead you. Like a cat licking its paws for connection within and comfort for itself, you will be able to feel the oneness with Alfa’s work and not only feel but experience several layers of self-discovery. I have read many works of poetry throughout the years and I must say that this collection is amongst my top five favorites. My attention was grasped, engaged and settled as I read some of Alfa’s work, from ‘It Was A Gift,’ ‘Artist,’ ‘Conquest,’ ‘Mask,’ ‘Miniscule’ and ‘Leaving’ to ‘Crawling.’ Look at how Alfa holds you captive: “He was a window shopper,.....but my heart was tired of being peeked at. It didn’t want to be the reason for buyer’s regret, it wanted to be the reason. All his reasons.” (Window Shopping). Depending upon which chapter you begin with will determine which parts of your emotions will be touched. When life happens, don’t stop breathing; force out the negative emotions, circulate your thoughts, embrace the soft touch that the universe gives you, and release it all to God because only He can provide you with the serenity, comfort, and answers that you need. In Zephyr, the third movement of Abandoned Breaths: Poetry, Quotes, and Poetic Prose, poet Alfa begins to recognize that she and only she is in control of her emotions as well as the next phase of her life. As she emerges from the fires and ashes of a lost love, Alfa grasps the knowledge that her past is just that and she can and will accept a new path. “I hope you never have to bury your soulmate, knowing they still walk upon this earth.” ~Buried Alive. Finally, the poet offers her last words of wisdom in the fourth section of Abandoned Breaths: “Accept yourself in your entirety. Let the scars heal, and do not pick at them.” In this final chapter she recognizes the Exhalation that his revelation involves. This is a sincere perspective of the stages of a failed relationship that truly lifts the soul of the reader, urging multiple readings. A beautifully written testament. I loved it! Abandoned Breaths, by Alfa, is a collection of poetry that endeavors to define the unfathomable aspects of love, from the joys that love can bring to the sorrow of being alone, alongside the bittersweet journey of falling out of love. The book is separated into four parts. The first part, Squall, is about the poet losing her lover. Monsoon details the overwhelming sadness that washes over the poet when she realizes he isn’t coming back. Zephyr describes how the poet is getting over him, despite the painful memories that assault her. Finally, Exhalation shows her being grateful for everything he put her through, despite the loneliness she felt with him gone. The fact that the poet named each part of her book after a form of air was wonderful. After all, when you first break up with someone you thought you loved, you’d be devastated. Squall and Monsoon demonstrate just how much of an ordeal that can be. However, when the storms of your own heart finally die down, leaving you hollow from the love you once had, you can finally begin to recover. Gentle winds come back, to the point where even the pain begins to fade. You can continue with your life, and though it may be hard at times, you can think back on that relationship with fondness, knowing full well that you’ve become a better person because of it. Alfa’s words were loving and encouraging, and though I did feel a few poems were out of place, I enjoyed the collection nonetheless. In a way, it was kind of like listening to a soothing lullaby after a nightmare. Abandoned Breaths: Poetry, Quotes, and Poetic Prose by Alfa is a collection of over a hundred heartfelt short pieces divided into four sections (Squall, Monsoon, Zephyr, and Exhalation) that chronicle the mysteries of love, breakups, and flawed human relationships. Many of the earlier poems are the most tragic, while the third section is more contemplative and the final one is the most empowered, but the structure isn’t too stiff or absolute. Each poem stands excellently individually as well, and many of the pieces can be applied to any time of life or situation. This is how memes can be raised from brief snippets of our daily lives into soaring music. Alfa’s subliminal skill and exquisite verbal artistry elevate this volume to a high level of accomplishment. Abandoned Breaths by Alfa is a truly exceptional book. The words slide over the senses like a waterfall of beauty, philosophy, and emotional integrity, and the book is brimming over with rapier-like thoughts that allow readers to feel kinship with others by having their buried feelings expressed. Among the many melodious verses, some that lingered the most in my mind were, “Goodbye Dance,” “Patchwork Quilt,” “Season of the Monsoon,” “Testimony,” “Screaming,” “Metamorphosis,” “Eyes,” “Diamonds,” and “Lesson Learned.” But the lovely writing is matched by the simplicity that comes from complete honesty and this is what makes the book so strong. “He was a bruise . . . not a tattoo. Don’t ever forget that.” A stand-out collection that should be on the shelf of any poetry reader. Abandoned Breaths: Poetry, Quotes, and Poetic Prose (First Edition) by Alfa is a collection of poems on love and heartbreak. Most of the poems in Abandoned Breaths deal with the idea of romantic love, breakup, and the heartbreak that ensues. While some of the poems are in the form of simple quotes or prose, the majority of these are poems. The book is divided into a few major sections, and although the theme of romantic or passionate love is underlying, the book specifically deals with the aftermath of a failed relationship or unsuccessful love. It is indeed more about the devastation, sadness, tears, and despair that are involved in a heartbreak. I thought Abandoned Breaths: Poetry, Quotes, and Poetic Prose by Alfa was an enjoyable read. I especially liked the formatting and fonts used in the book, which added to the aura or vibe of the collection. The writing style is quite fluid and indeed evokes the feelings of despair and dejection after a romantic relationship ends. I enjoyed the poetry more than the prose in the book, but that’s just me. Overall though, I enjoyed this collection and the way it sheds light on the human heart’s deepest, darkest emotions. Sadness often leaves a deeper scar than joy and there are very few people who have not experience the sadness of a heartbreak. I am sure most people reading this book will empathize and the poems will certainly resonate with them. I ain't really the poetry reading kind of guy, but bought the book anyway as I was intrigued by the cover. Reading the book, I found that I could relate to most of the writings. Things I have felt, seen, and heard. I had no idea that Abandoned Breaths would put into words the thoughts that have tumbled around in my subconcious for years! Alfa has a way with words that make you want to read, and reread, her book again and again, each time discovering a new perspective. I ended up purchasing a couple more copies to give to others that can use the insight you can't help but learn. Men may be from Mars, and women from Venus, but the true Poet is from Louisville! I also have an additional copy stored in my safe with all my important papers in case my current, well read copy is ever misplaced (or eaten by one of my many dogs). If you haven't already purchased Abandoned Breaths, I highly encourage you to do so! And if you HAVE already got one, get one or two more as they will make for great gifts! Alfa’s debut book Abandoned Breaths took my breath away and then breathed it back in through my soul. There are few writers today who can weave words as artfully and authentically as Alfa can. She has a rare gift for revealing the deepest feelings and skilfully writing them into her gorgeous prose; feelings we have all felt, sometimes without knowing we felt them until a certain word flies off the page and slaps us across the face. The poetry in Abandoned Breaths is brilliantly placed within the book in four different parts: Squall, Monsoon, Zephyr, and Exhalation, which adds to the feeling of being taken along an often hard, but utterly gorgeous journey. I expected this book to be good but it has exceeded every expectation. Abandoned Breaths is classic Alfa; amped up and full of delivery. This book is unflinching in its honesty and gorgeous in its vulnerability, but the message carried throughout the book is a message of hope, resilience, and strength. Alfa’s work is timeless, and Abandoned Breaths will go down as a literary masterpiece. Abandoned Breaths will wreck you, and then it will put you back together again in the most beautiful way.